Zombieville USA is a bloody, fun game from Mika Mobile. You control a lone scowling hunter in a town overrun with the lumbering (and, occasionally, scampering) undead. Luckily for you, you’re armed. This Is My Boom Stick: Zombies may want to snack on brains, but in Zombieville USA, you’ll make them eat lead. There’s not a tremendous amount of depth to Zombieville, but that’s not necessarily a criticism. The game looks great, with well-drawn art that suits the cheeky mood. (The game’s first screen upon fully loading instructs you to “Touch… If You Dare!”) You start with a gun and a finite number of bullets, and within seconds, you’ll need to start shooting at zombies—or risk becoming literal brain food. The controls are pretty intuitive; tap and hold on one side of the (landscape) iPhone or the other to move in that direction, and tap smack dab in the center to fire your weapon. When the zombies approach, it’s really a “kill or be killed” situation: When they make direct contact with you, you’ll lose health, and if you can’t shake them off and gun them down, you’ll die. As you walk through town, picking off zombies, you can duck into the many houses that dot the path. They’re all abandoned (presumably, the zombies got there first), and they’ve all been left unlocked. Inside some, you’ll find additional ammo, and inside others, you’ll find cash. Cash? Yep, it’s important to every good zombie hunter. In fact, to add insult to zombie injury, each time you blow one away, you take any money the zombie was carrying. (Side note: Why do zombies need money anyway? Unfuneral expenses?) In between levels, you can use that cash to purchase ever-more-powerful weapons and ammo. For a while, the guns just get a little shinier, and maybe a tad more powerful (meaning you’ll need fewer bullets to take down an undead attacker). But save up enough scratch, and you can buy some pretty serious tools. Some might say you haven’t lived till you’ve torched a few zombie with a flamethrower or torn them down with a chainsaw. Besides their obvious amusement factor, these weapons form the $2 game’s sole strategic component. You need to save and spend your money wisely, because on later levels the zombies come so fast and furious that you’ll need the higher-powered stuff to survive. The only other temptation that you’ll occasionally need to spend money on is the first-aid kit that restores your health. That’s because Zombieville—in what I hope is its sole connection to reality—affords you but one life to live. When you die, the game ends. Frankly, that’s a bummer sometimes—like when you’ve powered through nine levels, merrily (but anxiously) gunning down zombies the entire time and finally get trapped and decapitated by a few of them. If you want to keep playing, you’ve got to start back at level one again. Ultimately, though, since the core of Zombieville’s fun is killing zombies deader, that’s not so terrible. Starting over just means you have a fresh start on creating zombie carnage. By this point, you already know if you’ll enjoy the game. If Zombieville USA sounds like a hilarious shoot-em-up game to you, I’m sure you’ll love it. 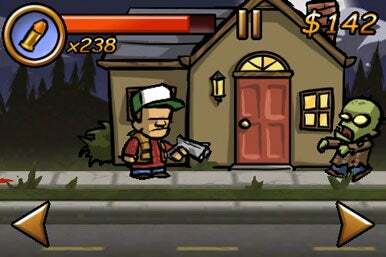 Zombieville USA is compatible with any iPhone or iPod touch running the iPhone 2.2 software update.